Over the past few years, state and school district education leaders have renewed their focus on the quality of learning materials available in our nation’s classrooms (Chiefs for Change, 2017; RAND Corp., 2016; RAND Corp., 2017). Many leaders have been dismayed to find that existing proprietary textbooks and supplementary resources often do not match their teachers’ and students’ needs (Ishmael, 2018a). Fortunately, there is a growing recognition of teachers and school leaders who are addressing this challenge head-on through open educational resources. Simply put, open educational resources, or OER, are “high quality teaching, learning, and research resources that are free for others to use and repurpose”(Hewlett Foundation, 2015). OER range from entire curricula and textbooks to smaller grain-size learning materials, including assessments, videos and images. OER enhance teaching and learning in several ways. First and foremost, OER can empower teachers. Unlike most proprietary educational resources adopted by state and local educational agencies, which are static or prohibit educators from altering them, OER can be regularly updated and personalized to ensure that materials continue to be relevant for students. Enabling those teaching in the classroom on a daily basis to decide which resources most support the unique needs and challenges of their students recognizes teachers as creative professionals with subject matter, design and pedagogical expertise. 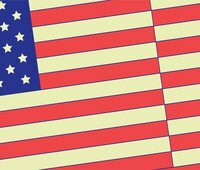 Second, OER can serve as a tool for educational equity. Given that open licenses permit free distribution, quality learning materials can reach all student populations. Lastly, OER can allow state and school district leaders to reinvest funds otherwise budgeted to purchase proprietary materials. The dollars saved can be used instead to support critical professional development for teachers, expand personalized learning opportunities for students, and maintain a robust technology infrastructure to aid digital learning. After observing the many potential benefits of OER adoption and a general lack of awareness about the relevance and usefulness of OER, the Office of Educational Technology (OET) within the United States Department of Education (ED) launched the #GoOpen Campaign on Oct. 29, 2015. The goal of #GoOpen was to increase educators’ awareness of OER, catalyze communities of practice, encourage infrastructure investments, and identify sustainable models for OER implementation beyond its use by a single teacher working alone in his or her classroom. This initiative highlighted states and school districts successfully using OER, recruited key partners such as educational nonprofits and private-sector companies, coordinated opportunities for collaboration through national and regional summit events, and provided essential resources for educators new to using OER. In the nearly three years since the inception of #GoOpen, ED has recognized 116 school districts (OET, 2018a) that have officially joined the campaign, all committing to replace at least one proprietary textbook with OER. Furthermore, 20 #GoOpen States (OET, 2018b) have also joined ED’s campaign, committing to support school districts in this transition. As this work has continued to grow, OER stakeholders have tracked the progress (Ishmael, 2018b) of this movement and uncovered a growing number of districts (Ishmael, 2018c) outside the #GoOpen Campaign that are also leveraging OER to benefit their students and teachers. 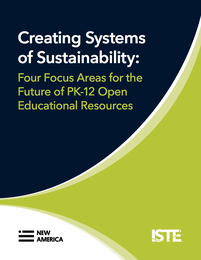 Within the same time period, the diverse community of PK-12 OER stakeholders, comprised of teachers, district and state leaders, researchers, and educational nonprofits, realized that merely orienting the implementation conversation around the logistics of a single textbook replacement for a single subject is not enough to sustain the growth of the nationwide OER movement. In order for educators to continue taking advantage of these new learning materials in the future, a much more systemic approach to OER is necessary. To better understand the factors needed to ensure the longevity of OER, the International Society for Technology in Education (ISTE) and New America identified and convened members of a growing “PK-12 OER Learning Network” on March 9, 2018, and June 23, 2018. Drawing from each member’s unique perspective and expertise, this learning network identified and dove into four key focus questions. What types of enabling policies remove existing systemic barriers to OER implementation? What types of mentoring and support structures enable districts to benefit from the existing body of knowledge about OER? What research must be conducted to identify best practices in OER implementation? How can enabling policies, mentoring and support structures, and research synergize to develop coherent sustainability models? The following sections spotlight three school districts — Liberty Public Schools in Missouri, Garnet Valley School District in Pennsylvania and Broken Arrow Public Schools in Oklahoma — that have been nationally recognized as pioneers of systemic OER implementation. Subsequent sections, authored by the learning network’s education researchers, will draw out critical themes from the case studies and discussions from the two convenings to begin answering the four aforementioned focus questions. Overall, the consensus from these district leaders and researchers is clear: Ensuring the longevity of OER cannot be achieved by simply examining which proprietary textbooks can be substituted with openly licensed ones. This effort requires deliberate, coordinated, and systemic reform strategies from both states and school districts. View our OER videos featuring state and district leaders here.